The aspiration of linking northern England to central Scotland by rail - overcoming the barrier of the Cheviot Hills - took a step forward in July 1845 when construction of the Newcastle & Berwick Railway was authorised. Promoted by George Hudson with an eye on expanding his empire northwards, its route ran broadly parallel with the east coast, generally between three and seven miles inland. It forms part of what is now the London-Edinburgh main line. Included within the scheme were branches to Blyth, Kelso, Warkworth and Alnwick. With several major viaducts needed, the line’s opening was accelerated by erecting temporary timber structures whilst the permanent ones were built beneath them. This approach ensured that the 14 miles from Heaton Junction to Morpeth could open on 1st March 1847 whilst trains started running between Tweedmouth and Berwick four weeks later. The connecting section proved more difficult, only receiving Board of Trade approval in June for opening on 1st July. Barely a month had passed when the Newcastle & Berwick merged with the York & Newcastle to become the York, Newcastle & Berwick Railway. 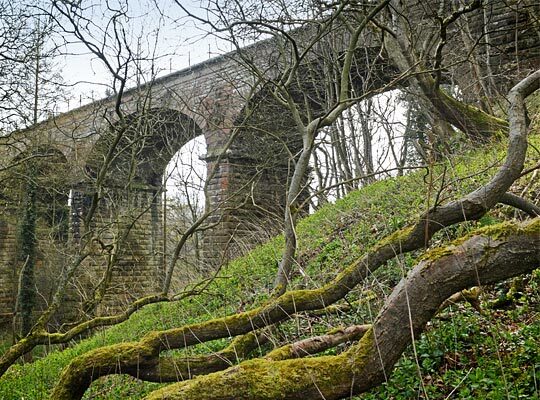 Although just 2¾ miles in length, the Alnwick branch punched above its weight with eight cuttings, seven bridges and a viaduct between the junction at Alnmouth and its terminus. Double-track throughout, it was costly to build and operationally challenging due to its tight curves and 1:77 (steepest) gradient, rising towards the town. These shortcomings were foisted upon engineer Robert Stephenson by Viscount Howick, a key local landowner, who was implacably opposed to any railway incursion onto his estate. Work got underway in August 1848, progressed by contractor Rush & Lawton at a cost of £34,897. The branch opened for general traffic on 18th August 1850. 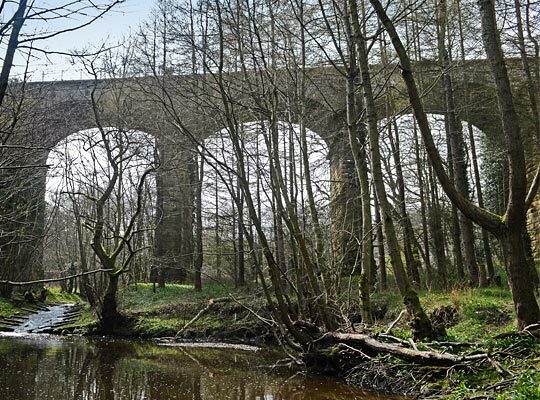 The most significant structure, Cawledge Viaduct, carried the line for 135 yards over the burn from which it gains its name. From the east, the line curved sharply northwards as it passed over the approach embankment; it straightened after the first couple of spans. 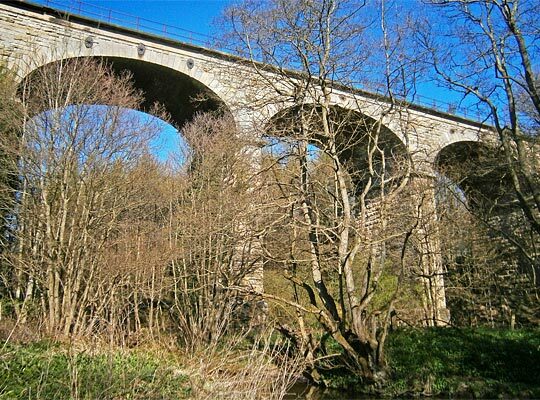 There are seven in total, with the central arch carrying the track over the stream at a height of 53 feet. The arches measure 45 feet in span, but their rise is shallow, only around 14 feet. Stone was used for most of the construction work, the tapered piers being topped with projecting, curved imposts; off these spring the brick arches. There are no parapets. 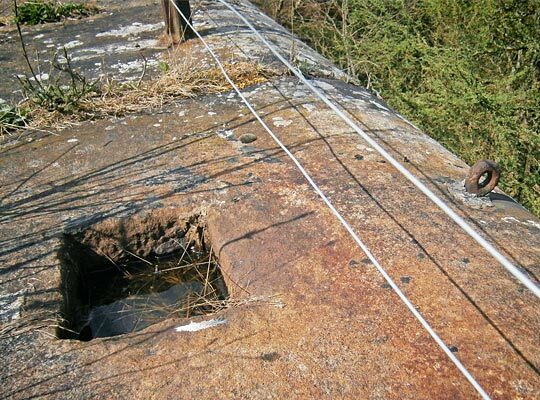 Instead fencing was provided at both sides incorporating tubular handrails and posts, the latter being anchored into large, masonry oversails. Substantial dressed copings sit above the abutments at both ends. Three rods and pattress plates have been installed above each arch to tie the sides together. Some brickwork spalling is apparent, a function of significant water penetration which has caused extensive staining to the barrels. Two of the piers are wrapped in ivy. 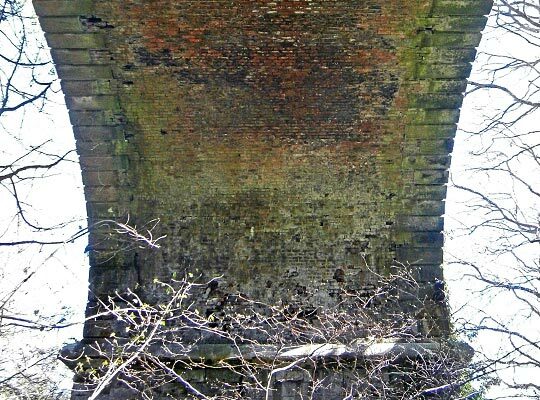 Generally however the viaduct remains in fair condition. The Alnwick branch was rationalised in 1965 after escaping Beeching’s axe. One line was lifted and signalling control transferred to Alnmouth. However this was only a temporary reprieve. Passenger services were withdrawn in January 1968 and goods traffic ended on 7th October. Soon after, the railway was cut in two by the A1 bypass, running around the east side of Alnwick. In 1995, the Aln Valley Railway Society was formed with the intention of reviving the line. 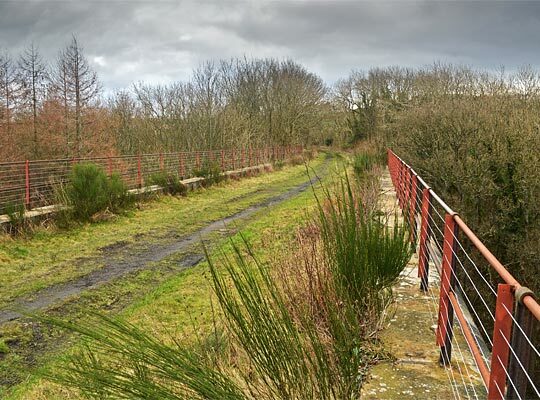 A station has since been established in a field on the east side of the A1 and it’s hoped that a single track - with footpath alongside - will be relayed back to Alnmouth in two phases. A grand reopening is pencilled for 2020. 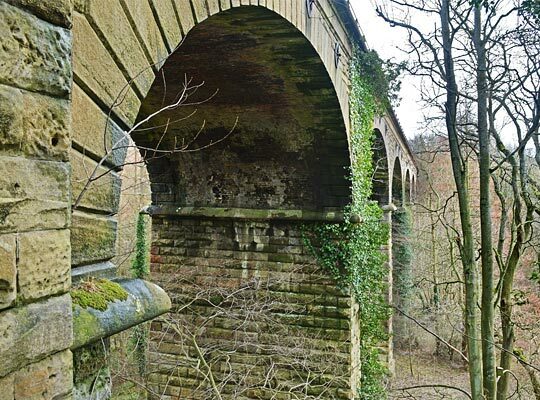 Some maintenance and drainage work will be required to Cawledge Viaduct as part of the project.